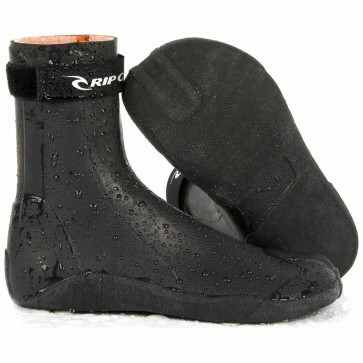 Dipped in liquid neoprene and providing a waterproof seal, the Rip Curl Rubber Soul Plus 3mm Split Toe Boots keep your feet warm and ready for action. With a secure velcro closure on the chimney of the boot and soft Flash Lining inside, these boots resist flushing through the top and stay warm and cozy within. Enjoy a supple and smooth feeling surf bootie that allows for an improved sensation of your surfboard underfoot with the Rubber Soul Plus. These booties are awesome, thanks Cleanline! These booties are perfect. They're super warm, the rubber connection between the big toe and the rest of the toes should help them last a long while. Cleanline support team is also fantastic!